Viewers who tuned in to ITV's An Audience With Michael Buble were astounded tonight when the Canadian crooner opened his mouth and emitted sounds normally associated with a synthesiser. His usual dulcet tones were transformed into an electronic buzz somewhere between a kazoo and the instrumental break in Peter Frampton's Show Me The Way. The sound is often associated with Auto-Tune, a system which processes the vocal track and synthetically adjusts it to hit the correct notes. 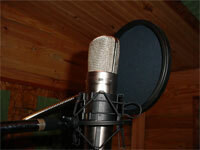 It is usually applied very carefully to ensure that a natural singing voice is heard. However, in this case someone had turned the Auto-Tune up to 11. Whether this was an effect applied during the actual concert or as a post-production 'enhancement' was unclear, but the result was a voice which at times consisted of 90% Auto-Tune and only 10% Buble. Remember the Simpson's episode where Bart and his friends are in a boy band? They can't sing in tune, but that doesn't matter because there's a machine to sort it out. But even that didn't sound as artificial as Michael Buble hitting all the notes of Cry Me A River with plonked Casio keyboard perfection and a vibrato reminiscent of a Farfisa organ. In 1998, Cher's song Believe famously used the distorted Auto-Tune vocal effect to create a sound which has been used on thousands of tracks since. It creates that robotic singing that sounds a bit like someone shouting through a mouth-organ. If you still can't pinpoint it, try to visualise Stephen Hawking - The Musical. What is rather strange is that Michael Buble can sing in tune, and has a natural voice that many people like. Why they felt it was necessary to try to make him sound like a 1970's Stylophone is unclear. The show is on ITV Player for a month - here.